Promise Bound by Anne Greenwood Brown. The Third Installment in her Mermaid Trilogy. Review: There are creatures that can breathe in water. They call them mermaids. They're all around you, living next to you, eating with you. You don't know what they really are, and they don't mind. They practice their manors and await the real frenzy that enhances as you hit the water. In the thrilling closing to Lies Beneath and Deep Betrayal, Anne Greenwood Brown gives you Promise Bound, as serious as it sounds. Falling in love is a roller coaster. Caldor and Lily never think that it would go down, but when it does, they crash. Lily has taken the duty of guarding Nadia's pendant, but that includes sleeping through the dead mer's memories. Stuck to the conclusion that Nadia wants Caldor to find his real parents, Lily makes a tough decision that could end it all. All the while though, trouble is brewing when mortal, Jack, takes the responsibility of Pavati's new child. And the two mer sisters quarrel for the leadership of the clan and the loyalty of Lily and her father. Any young adult readers will melt into the book and experience the journey right along with Lily and Caldor. Through heart-breaking break-offs, turf wars for leadership, and emotional conflicts, come along with Caldor and Lily as they figure out what life is all about. You race right along with them on the beaches, in the waters, and through all the dangers the fighting mer's put them through. Go through Lily's experiences, Caldor's choices, and the decision that seals their fate. We would like to thank Random House for providing a copy of Promise Bound for this review. 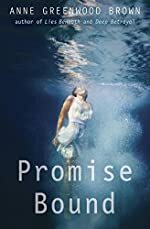 Have you read Promise Bound? How would you rate it?